“Why Atlanta?” That was my one question for Chris when he suggested a side trip to Atlanta after we spent some time exploring Nashville. Atlanta was just not on my radar for top family travel destinations. Every single site we visited in Atlanta seemed hand-picked for families with young children. Trevor had the time of his life! And Chris and I loved Atlanta and all of the family-friendly spots just as much as Tru. How often does it happen that everyone in the family is equally thrilled with every site along the way? Now that I’ve explored the city myself, I’d whole-heartedly recommend Atlanta as an amazing travel destination for families. Chris and I have visited many zoos on our travels, and Atlanta definitely ranks as one of our all-time favorites. There is so much to love about this place. It’s a really huge, sprawling zoo with so much to explore, from gorillas and orangutans, to lions and tigers, to elephants and pandas. Zoo Atlanta is beautifully landscaped and pristine, with large shady trees everywhere that kept us cool under that unforgiving Atlanta sun! The zoo also included some adorable rides for kids (including a safari-themed carousel and a small train). Plus a splash park and plenty of quick-service spots for food and drinks. The park had such a natural, scenic, peaceful atmosphere (rather than that chaotic amusement park feel), which is what I loved the most about Zoo Atlanta. It turns our that Atlanta has not only one of my favorite zoos but also, definitely, my favorite aquarium. Georgia Aquarium is just huge (one of the largest in the world!) and impressively beautiful, with so many fascinating exhibits and shows. We were in awe over the most gigantic floor-to-ceiling tank, which housed some equally colossal sea creatures. …with equally stunning fish and sea creatures! There’s a penguin exhibit where kids can pop their heads up and gaze at penguins through glass tubes just inches from the penguins. Plus, a moving walkway that took us on a ride through a tunnel-shaped aquarium where the fish swam beside and above us! There are also lots of interactive experiences and live shows available for an additional cost. We loved the dolphin show and would call it a must-see for families at the Georgia Aquarium. Several dolphins and their trainers show off incredible tricks (although I unfortunately can’t share photos since cameras were not allowed). I don’t care for the taste of soda, and I don’t drink Coke. So the World of Coca-Cola was not on my radar. But Chris had heard about it and really wanted to check it out since he heard it was a real Atlanta landmark. World of Coca-Cola is literally steps from the Georgia Aquarium (right across a small park). So it was just so easy to stop in and check it out after visiting the aquarium. World of Coca-Cola has a very noisy, lively feel (like a children’s museum or a science museum), so families with young kids can feel very comfortable and welcome here! And, even for someone who’s not a fan of soda, I was impressed by this museum dedicated to Coke. It was full of vibrantly colored, floor-to-ceiling Coca-Cola memorabilia. Kids will love all of the lively interactive exhibits and entertaining videos. And I thought it was actually fascinating to check out the old Coca-Cola ads from nearly a hundred years ago (from as far back as the 1930’s). Some of the oldest items on display included a soda fountain from the 1880’s and a delivery truck from the 1930’s. At the end exit of the museum is Taste It!, which offers free samples of Coca-Cola flavors from around the world. It’s basically a free-for-all with endless soda fountains and mini plastic cups, so visitors can taste anything and everything. Trevor’s only two, so he didn’t really understand what was going on. He chose a flavor, “Bonbon Anglais” from Madagascar, that happened to be very bitter. He made a funny face, and after that, he wasn’t interested! Chris tried a few flavors and said he liked the sweet melon flavor of “Fanta Melon Frosty” from Thailand and “Minute Maid Apple Lychee” from Korea. Trevor had the time of his life at the Atlanta Botanical Garden. There were plenty of wide-open green fields throughout, so he was able to just be a kid and run around like crazy. And I loved all of the gorgeous, vividly colorful flower gardens. And the beautiful fountains and sculptures. 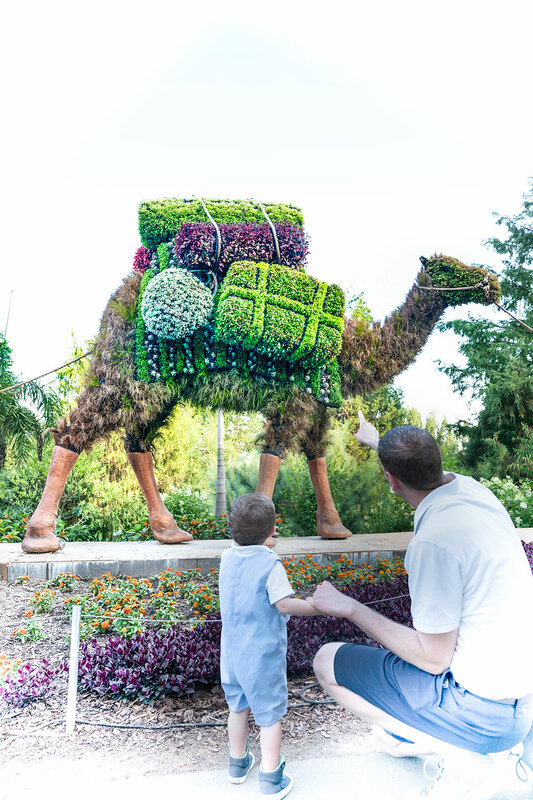 The Atlanta Botanical Garden will always stand out in my mind as one of my favorite gardens, though, because I was completely blown away by the Imaginary Worlds living sculptures. 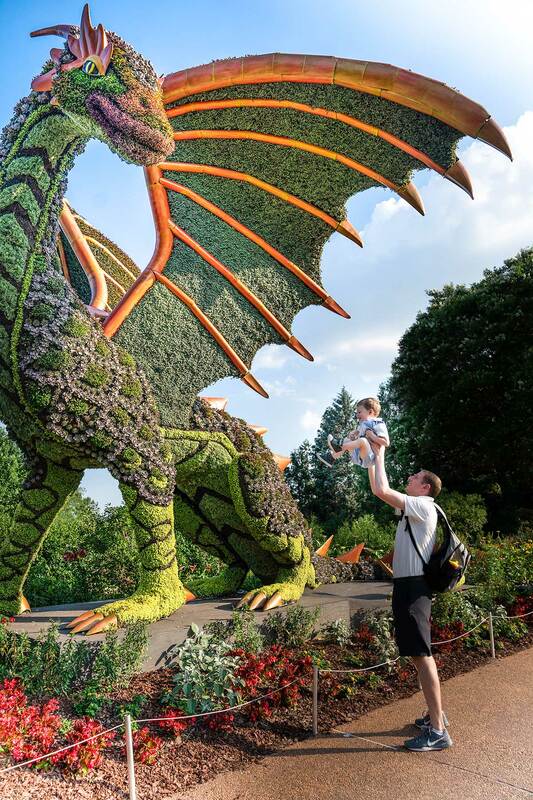 These intricately detailed topiary-like sculptures are actually hand-assembled living plants shaped as dragons, mermaids, and camels, to name a few. The Atlanta Botanical Garden offered the ideal combination of open park space for Trevor to play, plus interesting exhibits for Chris and I to enjoy too. So this one is a win-win for families! Trevor is only two, so he doesn’t seem to remember a lot from our travels. But he does remember the SkyView. When I ask him about our trip to Atlanta he says, “big wheel up, up!” and “big wheel round and round.” So SkyView definitely made a big impression on him! SkyView is basically a towering Ferris wheel (it reaches heights of 20 stories!) that offers sweeping views of Atlanta. Each family/party gets their own gondola, which is enclosed with floor-to-ceiling glass windows. The gondolas include benches on both sides, plus air conditioning for a comfortable ride. At the time we visited (about 6pm on a Friday), we waited in line for about 12 minutes, and we rode around the wheel about 4 times. We went close to sunset, which was a beautiful time to visit. The glaring midday sun was gone, and the whole city had a soft, warm glow. One side of the gondola offered beautiful views of Centennial Park. The other offered a panoramic city skyline view. Although we couldn’t check it out due to Trevor’s early bedtime, SkyView is typically open until 11pm. So I can imagine the view is spectacular at night too, with the city all lit up after dark!